NEW YORK, April 6, 2017 – Kelsey Plum of Washington, the Associated Press National Player of the Year, and South Carolina’s Alaina Coates, a two-time AP All-America honorable mention selection, headline a list of 10 prospects who will attend the WNBA Draft 2017 presented by State Farm on Thursday, April 13 at Samsung 837 in New York. ESPN2 will provide coverage and analysis of the first round beginning at 7 p.m. ET, and ESPNU will air the second and third rounds starting at 8 p.m. ET. Coverage of the entire draft will also stream live on WatchESPN and the ESPN app. Guards Kaela Davis and Allisha Gray will join Coates in representing the 2017 NCAA Champion Gamecocks at Samsung 837. Rounding out the list of prospects who will be in attendance are guards Alexis Jones (Baylor), Shatori Walker-Kimbrough (Maryland) and Sydney Wiese (Oregon State); forwards Nia Coffey (Northwestern) and Erica McCall (Stanford); and center Brionna Jones (Maryland). Samsung 837, the brand’s experiential flagship and cultural hub, is hosting the draft for the first time. The digital playground boasts three levels of experience zones including a VR Theater and three-story multimedia screen, which will serve as the backdrop of the event. Samsung 837 will provide a setting unlike any the WNBA Draft has featured before. The event is not open to the public. The San Antonio Stars hold the No. 1 overall pick in the draft after winning the WNBA Draft Lottery presented by State Farm on Sept. 28. The Chicago Sky will select second, followed by two selections for the Dallas Wings, who have their own pick at No. 3 and acquired the No. 4 pick from the Los Angeles Sparks in a trade that sent guard Odyssey Sims to L.A. on Feb. 17. Plum set the NCAA women’s record for career points (3,527) and points in a season (1,109 in 2016-17). She ranks second all-time – male or female – in NCAA history for career points, behind Pete Maravich’s 3,667. Plum was an All-America First Team selection in her junior and senior seasons, All-Pac-12 each of her four years at Washington, 2017 Naismith College Player of the Year, and winner of the 2017 Wade Trophy as the NCAA Division I Player of the Year. She also finished her career as the NCAA women’s all-time leader for free throws made (912), breaking a 33-year-old record. Coates was an All-SEC First Team selection as a junior and senior and an All-SEC Second Team selection as a freshman and sophomore. She was named to the SEC All-Defensive Team as a sophomore in 2015 and as a senior in 2017. Coates helped South Carolina to four straight SEC regular-season titles and a Final Four appearance in 2015. She is also South Carolina’s career leader in field goal percentage (62.0) and defensive rebounds (642). Davis spent two seasons at Georgia Tech before transferring to South Carolina, where she sat out the 2015-16 season before playing the 2016-17 season as a fourth-year junior for the Gamecocks. She subsequently renounced her remaining season of college eligibility to enter the WNBA Draft 2017 presented by State Farm. She was named the Stockton Regional Most Outstanding Player en route to the 2017 Final Four. Davis earned All-ACC Second Team honors in her first season at Georgia Tech, followed by All-ACC First Team honors in her second and final season with the Yellow Jackets. Gray excelled in South Carolina’s run to the national title, averaging 16.5 points on 56.8 percent shooting along with 8.3 rebounds in the tournament. She was selected to the 2017 NCAA Women’s All-Final Four Team and the Stockton Regional All-Tournament Team. Gray spent two seasons at North Carolina before transferring to South Carolina. Like Davis, Gray also renounced her remaining season of college eligibility to enter the WNBA Draft 2017 presented by State Farm. Baylor’s Jones made the All-Big 12 First Team as a junior and senior after spending two years at Duke. She also was an AP All-America honorable mention selection as a senior. After sitting out the 2014-15 season as a transfer, the Texas native was named the 2015-16 Big 12 Newcomer of the Year and the Big 12 Championship Most Outstanding Player. On Jan. 29, 2017, Jones recorded a triple-double (24 points, 12 rebounds, 10 assists) against Oklahoma, joining Brittney Griner as the only Bears to record a triple-double in program history. She also was named ACC Freshman of the Year at Duke and earned ACC Tournament MVP honors that season. Walker-Kimbrough was selected to the All-Big Ten First Team as a sophomore, junior and senior. She also earned an All-America Third Team selection as a senior and was an AP All-America honorable mention selection as a sophomore. In 2016, Walker-Kimbrough led the NCAA and set the Big Ten record for three-point field goal percentage (54.5). As a junior, she scored 41 points (on 17-of-21 shooting) against Purdue, the second highest single-game points total in program history. Oregon State’s Wiese was a four-time All-Pac-12 selection. She finished her career as the Pac-12’s all-time leader for three-pointers made (373). She was an AP All-America Third Team selection as a senior and an AP All-America honorable mention selection as a junior. In 2016, she played a pivotal role in the Beavers’ first Pac-12 Tournament title and first march to the Final Four in program history. A four-time All-Big Ten First Team selection, Coffey became the first player in Northwestern history to earn the honor in three consecutive seasons. She set a school record by scoring in double figures in 66 straight games, a mark she set from Jan. 22, 2015, to Jan. 14, 2017. Coffey also became the first Northwestern player with 1,000 career points and 1,000 career rebounds and just the fifth Big Ten player to tally 2,000 career points and 1,000 career rebounds. She was an AP All-America honorable mention selection as a senior. McCall, a two-time All-Pac-12 selection, is one of only four players at Stanford with at least 1,300 points, 900 rebounds and 190 blocks, joining Jayne Appel, Chiney Ogwumike and Val Whiting. As a senior, she was an AP All-America honorable mention selection and the Pac-12 Tournament Most Outstanding Player. Maryland’s Jones, who helped the Terrapins to Final Four appearances in 2014 and 2015, led the nation in field goal percentage as a junior (66.5) and senior (69.8). In 2016-17, she was an AP All-America First Team selection after leading the Big Ten in double-doubles with 25. As a junior, Jones was an AP All-America honorable mention selection. 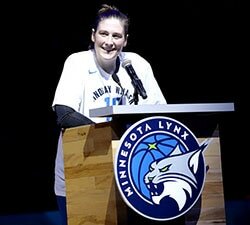 The draft takes place one month before tip-off of the WNBA’s 21st season and coincides with leaguewide single-game ticket sales for 2017. Individual tickets for all 12 WNBA teams will be on sale April 13. 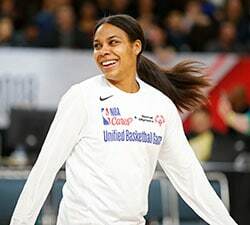 For ticket information, fans can visit http://www.wnba.com/tickets/ or team websites. The regular season opens on Saturday, May 13. 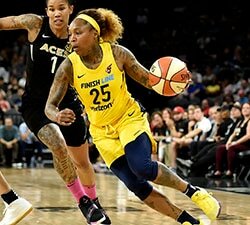 WNBA.com will provide complete draft-day coverage and serve as the web destination for fans who want to track the top college seniors in advance of the draft. 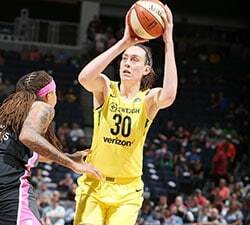 To view WNBA.com’s photo gallery of all-time No. 1 overall picks, click here.